"In 1912, the National Biscuit Company in New York released the Oreo, aka everyone's secret pleasure and the best-selling packaged cookie of all time. 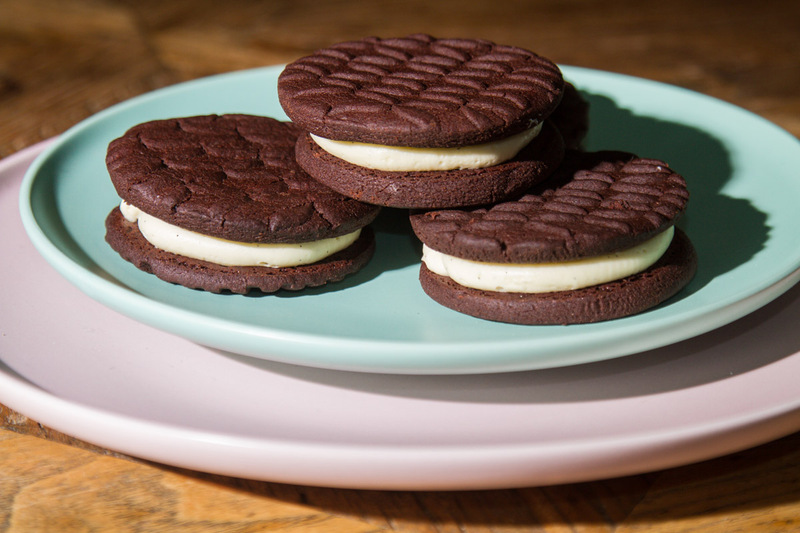 Production no longer takes place at the original facility (the building is now Chelsea Market, one of New York's best food halls), but the Oreo's connection to the city lives on in many sweet odes found across town." Yasmin Newman, Desserts of New York. I always like bang for my buck when cooking, particularly baking. I don't want to slave away for hours and in the end get average results. These Luxe Oreo cookies from the Desserts of New York hit that particular sweet spot of effort vs pay out. They are relatively easy without being too basic and the results are both aesthetically pleasing which is so important with baked goods and they are moreish beyond belief. Bling them up in any way you choose, I textured the surface of mine with a patterned cake decorating rolling pin. Consider taking a batch to work, it might get you that promotion without having to sleep with the boss. Preheat the oven to 160°C (320°F) and line two baking trays with baking paper. Sift the flour, cocoa powder, bicarbonate of soda and salt into a bowl and set aside. Using an electric mixer, beat the butter and sugar in a large bowl for 3 minutes or until light and creamy. Add the flour mixture and beat on low speed until the dough just comes together. Shape into two discs, then wrap one in plastic wrap and refrigerate until needed. Roll out the remaining dough between two sheets of baking paper until 3 mm. (1/8 in) thick. Using a 7 cm (2 3/4in) round cookie cutter, cut out rounds, rerolling the trimmings, and place on the prepared trays, 3 cm (1 1/4in) apart. Using a 6 cm (2 1/2 in) fluted cookie cutter, make an indent in the centre of the cookies to decorate, if desired. Bake, swapping the trays halfway through, for 15 minutes or until the cookies are just cooked (it's difficult to tell from the dark colour, but there may be small cracks on top). Remove from the oven and cool completely on the trays. Repeat with the remaining dough to make 40 cookies all up. Meanwhile, to make the mascarpone vanilla cream, place all the ingredients in a bowl and whisk with an electric mixer until stiff peaks form. Take 20 of the cookies and spread 1 1/2 tablespoons of the mascarpone cream over the flat side of each cookie, then Sandwich with the remaining cookies. Cover and refrigerate for 3 hours or until the mascarpone cream is firm, Serve chilled or at room temperature. The cookies will keep in an airtight container in the fridge for up to 3 days. This post is not sponsored, the book was purchased at full price and in my opinion, worth every cent. This recipe is brought to you with permission from Hardie Grant Books and Yasmin Newman. If you want all the recipes grab your own copy here. Trust me, you won't regret it.